Last week, I wrote about how my summer ROM flashing adventures breathed new life into my Droid Bionic, a phone that has gotten a “raw deal”–as admitted, word for word, by Motorola Mobility’s VP for product management, Punit Soni. As I mentioned, when a phone with very capable hardware such as the Droid Bionic isn’t being given the update treatment it deserves, you can either whine about it, or jump into the development community and take a little risk for what ends up being a nice reward. 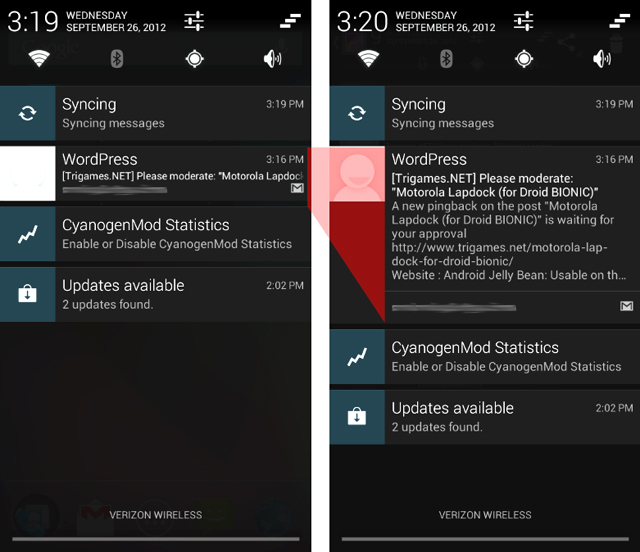 Now, Ice Cream Sandwich has been running quite nicely for those who took the risk–whether it be via a custom ROM or an unofficial, leaked Motorola Release not yet approved by Verizon. But this is still behind Android’s current best and brightest, Jelly Bean. Very few devices have been updated to Jelly Bean by their carriers, so unless you’re rocking Google’s Galaxy Nexus phone or Nexus 7 tablet, you most likely won’t get it without help from the development community. The same goes for the Droid Bionic, but the funny thing about the Bionic’s situation is the fact that we don’t even have an official Ice Cream Sandwich build yet. So, for those of you paying attention to the title of this post, you’ll understand the minor nuttiness here. Two famed Android developers, who go by the handles of DHacker and Hashcode, are responsible for bringing to the Bionic a port of Cyanogenmod 10, itself a custom ROM from a long-running series of excellent custom ROMs for Android devices. (You won’t find “official” Cyanogenmod ROMs for the Bionic anywhere–all instances of Cyanogenmod for the Bionic are ports done by other developers, given the locked bootloader problem alluded to in last week’s post.) While the alpha build has been floating around the development community for a few weeks now, only as of Monday did the duo get 3G/4G data working consistently, right from boot-up without any finagling (I was never able to get it to work before). They also managed to get camera functionality up and running, though you’ll need to use a 3rd party app for that (many community members swear by Camera 360 Ultimate; I think it’s pretty good as well) and movies need to be shot at a low resolution for the time being. But the inclusion of photos and data is enough to put even a ROM in alpha state over the “daily driver” jump (meaning that they’d be willing to use it on a daily basis). Most other phone functionality works, but among the things that still need kinks worked out are bluetooth connectivity, HDMI connectivity and getting the stock camera to work. You also won’t get Webtop with this, so if you’re using a Motorola Lapdock, you won’t be able to use it if you flash this ROM. I’ve been using Jelly Bean on my tablet for a few weeks already, and I was very excited to have it on my phone as well. On the web you can find several in-depth looks into what Jelly Bean has to offer, both from a bells-and-whistles standpoint and a subtle functionality standpoint. One of the subtle things that I’ve found makes my usage much snappier is the ability to expand an email notification to show you the first few lines of the email that comes in. It’s a trivial thing up-front, but I notice that I use it a lot, and I’m able to glean messages much quicker than if I were to open the message in Gmail and scroll through it. Project Butter is great, and although I previously used launchers and hacks to speed up the behavior of my phone’s interface on Ice Cream Sandwich, it’s nice to know that you’ll get a smooth UI experience without having to tweak anything. If you want to take the plunge, you’ll want to follow the universal Ice Cream Sandwich upgrade guide written by XDA member crobs808 here. Then, when you get to the “Optional” section, for downloading the ROM in step A you’ll want to grab the CM10 Alpha Build here.